Microsoft Virtual Server 2005 consistently proves to be worth its weight in gold, with new implementations thought up every day. With this product now a free download from Microsoft, scores of new users are able to experience what the power of virtualization can do for their networks. 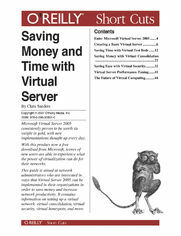 This guide is aimed at network administrators who are interested in ways that Virtual Server 2005 can be implemented in their organizations in order to save money and increase network productivity. It contains information on setting up a virtual network, virtual consolidation, virtual security, virtual honeypots, and more.